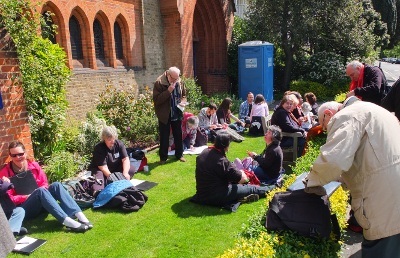 We loved taking part in this festival last year, so again we went to Ealing to sing with dozens of other choirs. We had a 10-minute slot in the first concert, at noon. We sang Hyon Da (Icelandic Seal Woman's Lament), Hana (Cherry Blossoms) (Japanese), Hallelujah, Ej Lasko, Lasko (Czech) and Blessing. Then, at the end, we sang the two festival pieces, Skye Boat Song and Can-Can, with the other choirs.